Sri Lanka is an often overlooked holiday destination – mostly due to the recently ended civil war – but it is now a vibrant and safe island to explore with a commendable collection of ancient and natural sights and amazing beaches. For much of the past three decades, large areas of the north were off limits, but this final frontier is now open, and Sri Lanka is now ready for you to explore its hidden treasures from the northern most tip down to the southernmost point. This road ride takes us all the way down the length of Sri Lanka through a wide variety of terrain. We start riding through the northern plains on flat terrain and explore the Jaffna Peninsula and surrounding islands with its unique mixture of colonial charm and vibrant Tamil culture. After dipping our tires in the Indian Ocean, we ride south to overnight at little-visited Mannar Island. We pass a plethora of temples and monasteries cycling through the rice bowl of Sri Lanka on our way to Kandy, home to the Temple of the Sacred Tooth Relic. A rest day in Kandy prepares us for the hills as we work our way south and enter tea country and start climbing on winding roads to the central highlands. What goes up must come down, and we descend to end our journey at the southernmost tip of Sri Lanka at Dondra Point and commemorate the occasion with another dip of our tires in the Indian Ocean. We start riding from the hotel inland along minor roads at a relaxed pace, experiencing rural Sri Lanka that most tourists seldom see. After lunch, we transfer to Jaffna, stopping to stretch our legs at Killinochi, the former headquarters of the LTTE, or Tamil Tigers. We ride through Jaffna with its small fishing port, passing the old Star Fort built in 1618. Crossing to Kyats Island, we head north. At Casuarina Beach at the northern tip of the island, we dip our rear tires and maybe ourselves in the Indian Ocean, a symbolic start to our journey south. Cycling south to Ponneryn, we cross another causeway, and our road sees little traffic now but saw some major battles during the conflict era. We stop for lunch at Iluppaikkadavai, where the road first greets the sea. We end our ride at a 700-year-old Baobab tree, brought by Arabian traders, on Mannar Island. We head back to the mainland riding inland through Giants Tank, a wetland habitat reserve. We reach our hotel for lunch and rest before heading out for an exploration of the ancient city of Anuradhapura. We start with a relaxed ride on a route dotted with temples and stupas. We turn off the main road towards Ritigala, a nature reserve. We end the morning ride at our hotel. In the late afternoon, we climb up Sigiriya Rock, a 5th century citadel. We cycle on quiet country roads past Kandalama Lake to Dambulla, the largest cave temple complex in Sri Lanka. We transfer to Melsiripura and then cycle through the spice growing region. We pass through Matale to start climbing up the Wattegama valley with terraced paddy fields and jungle covered hills. A rest day in picturesque Kandy -- an important Sinhalese religious centre. Explore the town’s old shops, antique and gem specialists, or the bustling market. A must do is the UNESCO World Heritage Site of the Temple of the Sacred Tooth Relic. The route will be hilly from here as we ride through the heart of tea country. We follow the Mahaweli River and cycle up to Hatton, one of the country's early tea plantation districts. More climbing, with a few rough sections of tarmac, up through tea estates. The last 30 km is on a good, straight flat road and ends close to Uda Walawe National Park. 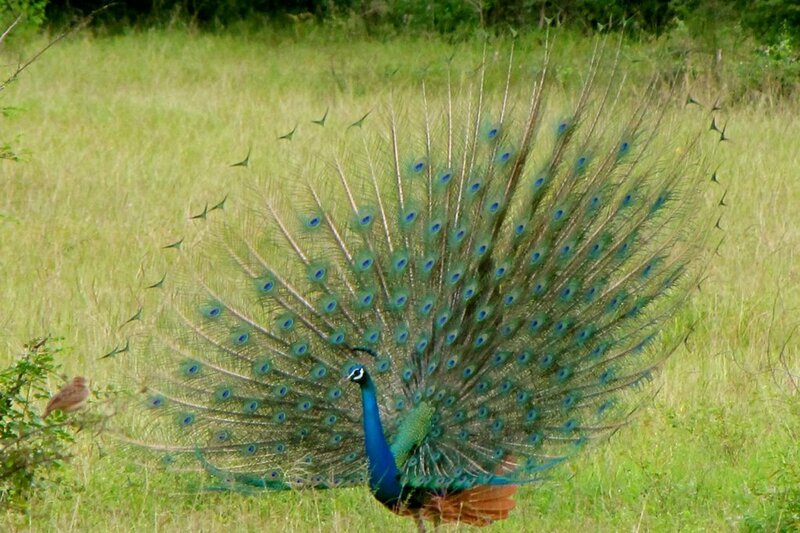 There is an option of an early morning safari in Uda Walawe park. Late morning, we start our last day cycling along scenic green paddy fields to Dondra Lighthouse, the most southerly point of the island. Here we again dip our tires in the ocean, marking the end of our tip to tip ride! Transfer to your Colombo hotel or extend your stay in Galle. Day 2 - Negombo - Jaffna Ride 102km. +649m / -567m. 80% of the roads that we cycled on in Sri Lanka were much nicer and safer than I expected them to be. Visiting Sigiriya and seeing the Elephants in Udawalawe were highlights (off the bike) for me. And the bike riding was great. There was a challenging hill day, and a day with strong wind, and more heat/humidity than I'm used to, but I enjoyed everyday of riding. The scenery was beautiful and it was a great way to see the country. And the people leading the trip (riding with us & driving the van/truck, ect.) were big part of what made our experience so great. They were wonderful! Highly recommend. Loved the Sri Lanka tour - great guide with local knowledge, beautiful countryside, fantastic food and excellent support by a very good staff. Peter was excellent. We really enjoyed the tour. A nice mix of people on the tour. Beautiful country special to explore by bike. Peter & his crew did an excellent job to make it an awesome unforgettable adventure. The first half of this 12-day cycling tour is on primarily flat terrain, so the daily distances are quite long. After our rest day, we ride up into the central highlands, and the distances are shortened to take into account the climbs. You will ride just over 840 km in 9 days of riding. 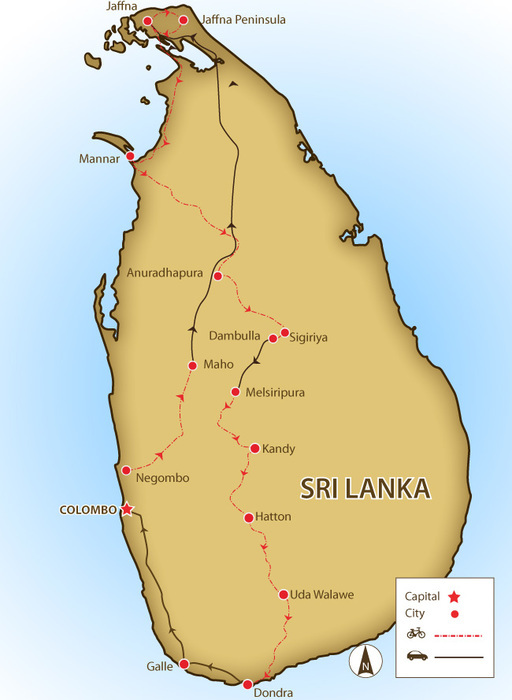 In addition, the route is designed for you to take in the best of Sri Lanka's culture, countryside, and wildlife. There will be one rest day for you to explore Kandy. Suitability: This is a tour for cyclists possessing a high level of physical fitness. Fitness will be a huge asset on those long-distance days and on the ascents in the hills. The tour is fully supported, and the bus is always close at hand for those that find the riding too difficult. Biking Conditions: This trip is on paved roads that are in good condition, though there maybe occasional short rough sections. The distances are long, but the climbs are gradual on easy gradients of 5%. In 9 days of cycling, we ascend a total of 7,557 m.
We meet at our Negombo hotel for a trip briefing and welcome dinner. After breakfast and final adjustments to ours bikes, we start riding out from the hotel heading inland along minor roads towards the north of the island at a relaxed pace, allowing us to fine tune the fit of the bikes. The area is known as little Rome due to the large number of Catholic churches, and soon the scenery gives way to paddy fields and coconut plantations. We take a break at a tea shop to regroup, snack, and top up our water. The next section on wending, flat village roads are a joy to cycle along, experiencing rural Sri Lanka that most tourist seldom see. The simplicity of everyday life and friendly smiles are the highlights of this ride. The last 20 km to lunch along a straight road allow us to power up our legs before ending at a small restaurant. We rack up the bikes and transfer 5 hours to Jaffna, stopping to stretch our legs at Killinochi, the former headquarters of the LTTE, or Tamil Tigers. We ride through Jaffna town with its lively markets and small fishing port, passing the old Star Fort built by the Portuguese in 1618 to defend the Peninsula. Crossing the causeway to Kyats Island, we head north along a straight road – ride as fast or as slow as you like! There are plenty of colourful water birds to see or photograph, painted storks and red-wattled lapwings to name a few. Regrouping at the ferry, we cross to Karaingar Island, continuing north to Casuarina Beach at the northern tip of the island, we dip our rear tires and maybe ourselves in the Indian Ocean, a symbolic start to our journey south to the southern-most point of Sri Lanka. After our picnic lunch and swim, we loop back to the main land, riding on a mixture of good and rough roads back to Jaffna. In the evening, we walk to a local restaurant for a tasty Masala Dosai, a crispy rice flour pancake with a spicy filling. Other authentic Tamil dishes are available as well. Riding from the hotel, we ride south to Ponneryn, a causeway crossing the Jaffna lagoon. The road sees little or no traffic now, but it saw some major battles during the conflict era, and the thick jungle hiding the scars of war is gradually being resettled. We stop for lunch at Iluppaikkadavai, where the road first greets the sea. The coastal waters around here are inhabited by rare sea mammals called dugongs. Once thought to be mermaids, they can sometimes be seen in the shallow waters around the bay. We continue our ride, again crossing a body of water, this time on the 2 km-long bridge to Mannar Island. We end our ride at the 700-year-old Baobab tree, brought here by Arabian traders. The massive truck is 19.5 m in circumference, and its thick grey bark gives it the nickname “elephant tree”. There's not much else to see on the island except for lots of white sand and palm trees, gulls and terns, wild donkeys, little lanes, and fishing boats. At the tip of the Mannar spit is Adams Bridge - a series of reefs, sandbanks, and islets that nearly link Sri Lanka to India. On a clear day, you can see the Rameshwaram Tower in India, 26 km away. You can enjoy a post-ride beer and swim in the India Ocean as we stay close to the sea. A quick transfer back to our bikes and re-crossing the causeway, we head back to the mainland, riding inland through an area known as the Giants Tank, a large inland lake built by King Dhatusena (459-477) and now part of a wetland habitat reserve. The lake's water irrigates the surrounding rice fields tended by the traditional farming communities, some still using water buffalo to plough the fields. We aim to reach our hotel for lunch, giving us the afternoon to rest before heading out for an early evening exploration of the ancient city of Anuradhapura. Dating from the 4th century BC, Anuradhapura was the capital of the Sinhalese Kingdom until the beginning of the 11th century AD and has some of the oldest and largest Buddhist monuments in Asia. During this period, it remained one of the most stable and durable centres of political power and urban life in South Asia. We visit the sacred Bodhi tree just after sunset when the pilgrims light “pahannas,” little clay lamps and incense sticks, giving it a heady atmosphere. For dinner, we visit the bus stand area for some street food: Kottu Rottie served with spicy gravy. This morning, we start with a relaxed ride through the ancient city region, dotted with temples and stupas along the Old Kings Route. The first section will be along a main road before we can turn off towards Ritigala, a nature reserve. Legend has it the rocky outcrop is part of the Himalayas, dropped by the monkey god Hanuman. When requested to bring a magic herb to heal his master, he forgot the name and brought the whole mountain. We end the morning ride at our hotel where we have lunch. In the late afternoon, we climb up Sigiriya Rock, a 5th century citadel built by King Kashyapa (477-495 AD). We approach the rock fortress through the royal gardens and a natural boulder entrance before ascending 220 m to the Lions Paw’s en-trance. The ruins of the palace on the summit are only surpassed by the magnificent views of the surrounding countryside. We cycle on quiet country roads directly from the hotel past Kandalama Lake to Dambulla. Dating from the 2nd century BC, it is the largest cave temple complex in Sri Lanka, adorned with thousands of frescos depicting the life of Buddha. After a quick visit, we load up the bikes to avoid a particularly busy and bumpy stretch. We transfer 1 hour to Melsiripura, and then it's back on the bikes again to ride quiet back roads for 32 km through Sri Lanka’ spice growing region. Here, we are surrounded by nutmeg, clove, and pepper plantations. We stop at a spice garden where you can take a short tour and learn about the medicinal uses for these plants. We then pass through very busy Matale to start climbing the Wattegama Valley, with terraced paddy fields and jungle covered hills. Now that we are back on minor roads, we can enjoy our ascent. We take a break at Madawela Bakery, a typical village eatery for a little energy top up of wadas, little cakes dipped in coconut and mango chutney are delicious, before heading into Kandy. A rest day in picturesque Kandy -- an important Sinhalese religious centre and a place of pilgrimage for Buddhists. Explore the town centre's old shops, antique and gem specialists, or the bustling market. A must do is the UNESCO World Heritage Site of the Temple of the Sacred Tooth Relic. Lunch and dinner is on your own tonight as there are many cuisines to choose from. The route will be hillier from here on out, so the distances are smaller, but the legs will still be challenged. Today, we ride through the heart of tea country with plenty of photographic opportunities almost at every bend. We then follow the Mahaweli River, and after 30 km, it's another ascent up to Hatton, one of the country's early tea plantation districts. We stay overnight on the edge of Castlereigh Reservoir. We start off with more climbing, with a few rough sections of tarmac, up through the tea estates, passing by Adam's Peak, the holy mountain of Sri Lanka, to a remote pass that is part of a wilderness forest reserve. While this area is home to the shy purple-faced langur, you are more likely to hear it than see it. We then begin our long descent, stopping at a lookout point with fine views across the southern part of the island and if it is clear, may-be even a glimpse of the sea. Continuing on back roads, we reach our lunch stop overlooking a small stream, which you are welcome to jump in to cool off. The last 30 km of our ride is on a good, straight flat road and ends close to Uda Walawe National Park. For early risers, there is an option of an early morning safari in Uda Walawe park, known for its herds of elephants and crocodiles and a plethora of bird life. Late morning, we set off to complete our journey along good roads with vast expanses of green paddy fields on each side. The simplicity of rural life is showcased as we cycle towards Dondra Lighthouse, the most southerly point of the island. With a ceremonial dip in the India Ocean with our front tires, we conclude our road ride from north to south. We transfer along the busy coastal road to our finishing point near Galle and have a celebratory dinner for our accomplishment! We can drop you off at a Colombo hotel or help you to extend your stay in Sri Lanka. Because some people can't imagine going on a trip without their own beloved bicycle, we do not provide them as part of this tour. However, you can hire bikes locally for the price listed in the tour pricing section. The bikes are Trek 2.1Cs and Specialised Allez or Roubaix. If you bring your own bike, please make sure it is a road bike in good mechanical order.